Bellafill is the longest lasting, most cost effective dermal filler available with the longest safety study of it’s kind. Eventually, facial aging catches up with us all. Although dermal fillers are often the preferred treatment for lines and wrinkles, many of them yield results that are temporary and require repeat touch-ups in order to last. Bellafill® is a different type of filler. Its ingredients provide volume that’s both instant and lasting — so you don’t have to decide between looking great now and looking great later. At Well Medical Arts we also use Bellafill as part our our non surgical facelift where we use filler in the temples to gently lift the lower face. NEW PATIENTS Click here to register to become a patient. at your convenience or call our patient care coordinators at 206-935-5689 to schedule your appointment. EXISTING PATIENTS please click HERE to schedule your appointment. Results in an instant that can last for 5 years? It’s possible with Bellafill. FDA approved for treatment of the nasolabial folds, Bellafill supports your body’s ability to produce its own collagen for up to 5 years with minimal to no repeat touch-up visits required. Suneva, the makers of Bellafill have taken part in a landmark clinical study that supports both it’s safety and effectiveness over a five year period. In this largest and longest study on injectable fillers, Bellafill® outperformed in patient satisfaction, longevity, and safety. At the study’s completion, 83% of patients were still satisfied with their results 5 years after treatment. Unlike hyaluronic acid fillers, which often dissolve within a few months, Bellafill creates a lasting improvement in your skin. Tiny, PMMA (polymethyl methacrylate) microspheres are housed within its smooth gel formulation. Once injected you can see immediate improvement. Over time, your body uses the microspheres to support the growth of your own collagen, leaving behind healthy-looking, resilient skin through five years. Bellafill contains lidocaine, a powerful local anesthetic that can help minimize discomfort throughout your treatment. 83% of patients were still satisfied with their results 5 years after treatment. Bellafill has been FDA approved for treatment of the nasolabial folds since 2006. 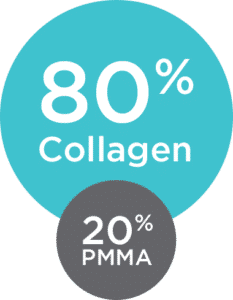 Bellafill contains animal-derived collagen in addition to its PMMA microspheres for an improvement you can see as soon as you leave the office. Meet Dominique Well, owner and expert injector. Dominique specializes in Natural looking esthetic services and has been perfecting her craft for well over a decade. She has is a Top 1% Injector of Bellafill in the Nation and often teachers other injectors how to become better at their craft. She takes the time to educate every patients and works to achieve your goals while staying within your budget. Call one of our patient care coordinators at 206-935-5689 to schedule your consultation to learn how Bellafill in the hands of an expert injector can turn back the hands of time.